Tensions are high in Germany as both supporters and opponents of the Patriotic Europeans against the Islamization of the West (PEGIDA) group are hitting the streets in record numbers. 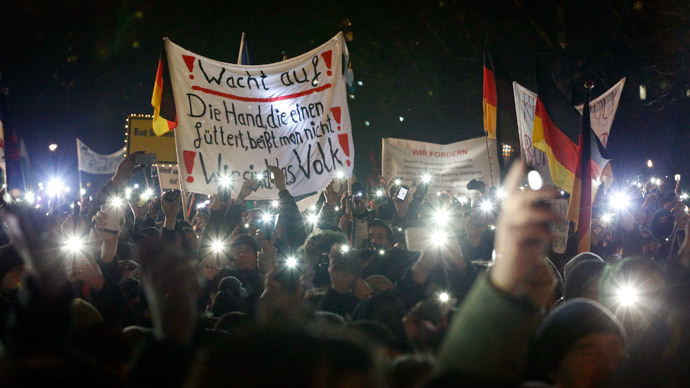 Thousands of PEGIDA critics are calling to block the “racist” rallies. 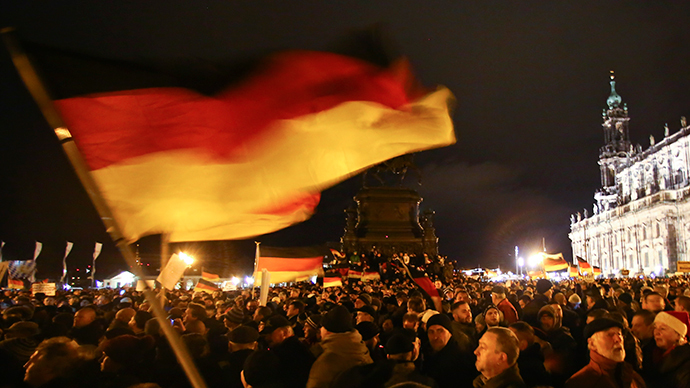 Around 30,000 people came out to protest against the PEGIDA rallies all across Germany, which they view as a racist movement, AP reported. People came out in Dresden, Berlin, Cologne, Stuttgart, Muenster and Hamburg, attempting to block the rallies organized by the group and carrying signs with slogans supporting immigrants. 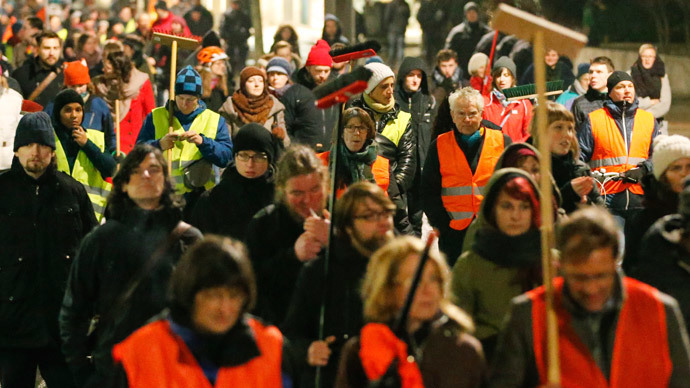 Meanwhile, Dresden reported a record number of anti-Islamization protesters on Monday. 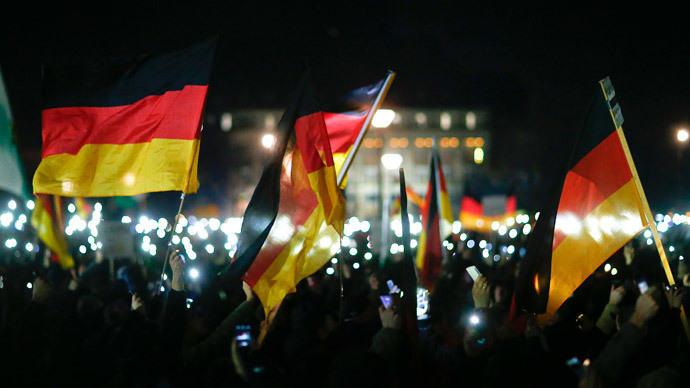 A PEGIDA demonstration attracted around 18,000 people, police said. Demonstrators carried signs reading “wake up,” as the crowd yelled out “we are the people” and “lying press”. Berlin saw 5,000 opposition protesters blocking around 300 PEGIDA supporters. The blockade prevented the group’s planned march from city hall to the iconic Brandenburg Gate. Footage from RT’s agency Ruptly showed people carrying signs with slogans ranging from “Stop the Islamization of Europe” and “[I am] against Multikulti, against parallel societies, against economic refugees” to those saying “I am for the freedom of assembly for all. Am I a radical now?” This is while a crowd of those blocking the rally shouted “Refugees are welcome here” and displayed middle fingers to demonstrators. “What is happening right now in Germany is just extremely shocking,” anti-PEGIDA demonstrator Ursula Wozniak said in Berlin, adding that she feels that the groups is taking advantage of the Germany’s democratic traditions. Cologne’s landmark cathedral turned off the lights to protest a PEGIDA rally as demonstrators gathered on a square nearby. Cologne Cathedral provost Norbert Feldhoff told n-tv that the symbolic move was meant to force the supporters of the group to think twice before joining. Other historical sites have joined in anti-PEGIDA protest, including Brandenburg Gate, other churches and a museum in Cologne, as well as the automaker Volkswagen’s manufacturing plant in Dresden. The town of Cologne recorded only 250 PEGIDA supporters on Monday, while couple of thousands anti-PEGIDA activists were spotted blocking off the group’s rally, according to police. Up to 22,000 anti-PEGIDA protesters in total gathered in other cities, including Stuttgart, Muenster and Hamburg, the DPA news agency reported. Dresden remained the center stage for the anti-immigration movement, with one of its weekly rallies recording 17,500 attendees just before Christmas. The group has been holding weekly protests since October against what they call the Islamization of Germany. Initially, the rallies drew only a few hundred people. Germany is the second most favored destination after the US for refugees and asylum seekers, according to a report by the Organization for Economic Co-operation and Development (OECD). In 2013, more than 450,000 people came to Germany as migrants. The group has tried to distance itself from the far-right movement, coming out against “preachers of hate, regardless of what religion” and “radicalism, regardless of whether religiously or politically motivated” in its mission statement. All uses of neo-Nazi symbols to represent the group have also been banned. “PEGIDA is for resistance against a sexist political ideology that emphasizes violence, but not against integrated Muslims living here,” the statement added. The manifesto calls for proportionate distribution of migrants across the EU, which would not leave Germany “shouldering the burden” alone. Currently, Germany accepts more asylum seekers than any other country in the EU, sheltering an estimated 200,000 refugees in 2014, double that of 2013.